Godey's Lady's Book, first published in Philadelphia in 1830 as Godey's Ladies' Handbook, was the leading women's magazine in mid-nineteenth-century America. Similar publications had been produced in Europe since the late eighteenth century and Godey's was closely patterned after its English and French counterparts. Several variations of the periodical's name occurred over time, including Godey's Magazine and Lady's Book, but the magazine is generally known by its most familiar title, Godey's Lady's Book. The magazine's founder and first publisher, Louis Antoine Godey (1804-1878), provided his female audience with a wide range of articles designed to educate and entertain. Godey's topics included fashion, travel notes, exercise regimens, practical advice for the housewife on home decoration, recipes, gardening, and crafts, plus fiction, poetry and essays by celebrated nineteenth-century authors, such as Harriet Beecher Stowe, Edgar Allan Poe, and Nathaniel Hawthorne. In the 1850s, Godey's had the highest circulation of any American women's magazine, reaching a peak of 150,000 subscriptions by the early 1860s. The periodical's success during these years was largely due to Sarah Josepha Hale (1788-1879), Godey's editor from 1837 to 1877. Before coming to Godey's, Hale edited her own literary journal, an experience that influenced her work at Godey's and strengthened the magazine's content, making it more appealing than its competitors. Fashion illustrations were part of Godey's from its first number. Single hand-colored fashion plates were issued until 1861, when folded double-page plates were introduced. The magazine also included descriptions of the outfits in the fashion plates, detailing fabrics, trims, and accessories. Additional uncolored plates illustrating accessories or individual garments were also found in most issues, along with needlework and craft projects, and occasionally, patterns. Godey's was not the first American publication to use hand-colored fashion plates-that distinction goes to a competitor started in 1826, Graham's American Monthly Magazine of Literature, Art and Fashion. The fashion plates in American magazines through the 1840s were generally inferior copies of designs that initially appeared in English or French periodicals. By the 1850s, the quality of the images improved because some of the metal engraving plates used in French publications were imported to the United States. The original captions on these plates were removed and new ones, such as "The Latest Fashions, only to be found in Godey's Lady's Book," were substituted. While tactics like these obviously resulted in illustrated fashions some months behind the latest European modes, they did give Godey's subscribers direct contact with such styles. Although homemakers were Godey's targeted audience, the magazine's fashion information and illustrations were invaluable tools for professional dressmakers in determining what was stylish and for tips in achieving the newest look. The resulting garments, however, were generally much less elaborate than those in the fashion plates. Beginning in 1870s, Godey's fashion influence was eclipsed by new publications like the high-style fashion magazine Harper's Bazaar, or others with a practical focus, such as What to Wear and How to Make It: Madame Demorest's Semi-Annual Book of Instructions on Dress and Dressmaking. It was also in the 1870s that Godey sold the magazine and Hale retired, accelerating Godey's decline as a quality publication. 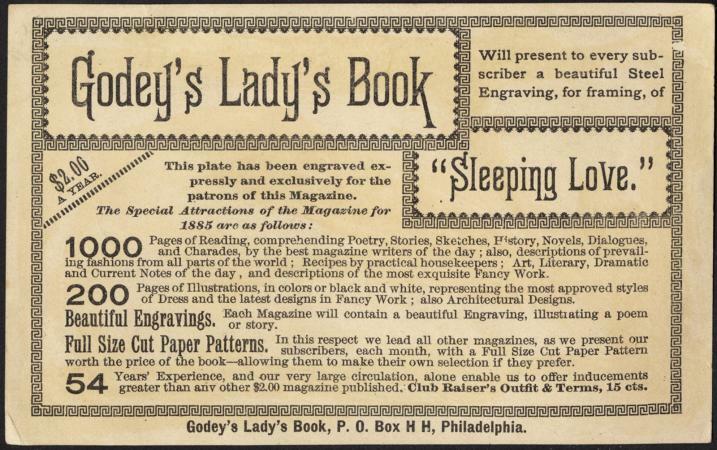 After passing through several owners, Godey's Lady's Book ceased publication in 1898. See also Fashion Illustrators; Fashion Magazines; Fashion Plates. Finley, Ruth Elbright. The Lady of Godey's, Sarah Josepha Hale. Philadelphia and London: J. B. Lippincott, 1931. Laudatory biography of the remarkable life of Godey's edited by Sarah Josepha Hale. Godey's Lady's Book, 1830-1898. A full run of this title can be found at the Library of Congress. Holland, Vyvyan. Hand Colored Fashion Plates, 1770 to 1899. London: B. T. Batsford Ltd., 1955. A history of hand-colored fashion plates that details the uncredited use of European plates in American magazines. Kunciov, Robert, ed. Mr. Godey's Ladies: Being a Mosaic of Fashions and Fancies. New York: Bonanza Books, 1971. A compendium of fashion illustrations and quotations from Godey's Lady's Book issues from 1830 to 1879, with an introductory history of the magazine. Mott, Frank Luther. A History of American Magazines. 6 vols. Cambridge, Mass. : Harvard University Press, 1938-1968. Comprehensive history of American magazines.